Sew Festive Handmade: I finally have some progress again! I finally have some progress again! Apartment/Townhouse/House-Hunting is consuming pretty much every waking moment of mine. I have had the misfortune of moving every year since I started college [so that's 5 places so far]. Last year was certainly the most horrific, as we discovered the house we were renting had roof leaks and horrible mold in the walls that was making us sick. We ended up having to move out suddenly, store all our belongings in my parent's garage, and sleep on the floor at people's houses for a month while we looked for a new place to live. I haven't been sewing too much because of all this real life happening, but I have a few things. 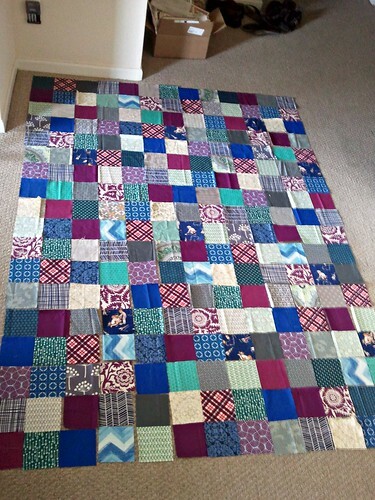 Kelly's charm quilt. She wants it to be queen sized, and this is only about 60x80", so I have a bit to go. Except I don't have any more floor space. I'm thinking borders maybe? I made this triangle log cabin last night to test out the idea I have for the new bee I'm in. I took the first month [because I'm impatient brave and bold and fearless!] and so I need to get cutting fabric to send out. 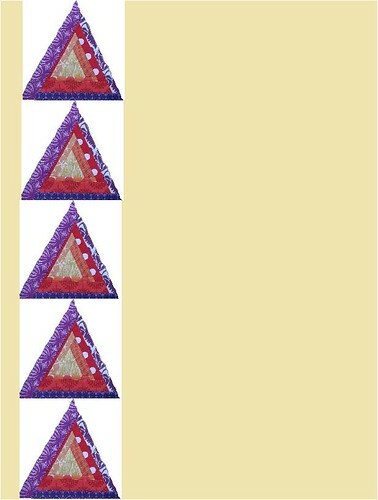 I'll be posting instructions up here tomorrow, so everyone could make log cabin triangles if they so choose! My super fancy mock-up. The background will be Essex linen in Natural, and the white will be some color once I receive all the triangles and decide what looks best. I'm still not sold on if I like it, but I think that's because it's made with warm colors while I almost always gravitate towards cool colors. I'm excited that the bee will help me embrace some of the reds and oranges in my stash! I'm also brainstorming and designing a mini for Jessica at Make Me Crafty. We're doing a little swap [so she can get her swappy toes wet]. She's going to be making me a pouch, because I really want one, but just can never bring myself around to doing it. Love those triangles! Borders would work well, I think. Are you going to the Sewing Summit? I know you said you might - I heard it sold out! I'm going to try to go next time. 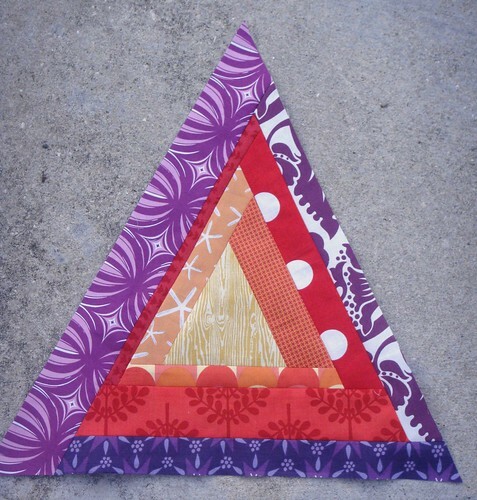 Love the colors you used in your triangle log cabin. Good luck with the move...it's never fun. I had to move every year in college myself, and I still remember it painfully. The triangle log cabin is wonderful! The charm quilt is gorgeous! Love those colours. I'm also crushing on triangles at the moment so that's a great choice. I hope the house hunting goes well! An update and a thanks! I think we have a home!